Growing scientific evidence has shown the crucial need for strength training for seniors in the ages of 50 to 95 years old. 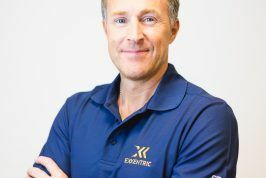 Here, Exxentric co-founder, Mårten Fredriksson presents the numerous benefits of strength training in general – and flywheel training in particular – for the senior population. Strength training is in many aspects more important than endurance training. Strength in the sense to exert force rapidly (also sometimes called power strength), is more important than maximal strength. Maximal strength takes about 2-3 seconds to develop isometrically which is far too long time when it comes to everyday life situations, such as to get up from a chair, walk stairs or prevent a fall. Sarcopenia occurs in healthy people. Usually, sarcopenia begins around the age of 50 and is often associated with ageing. It includes degenerative loss of skeletal muscle mass, the decreased quality in muscle-neuro-activation and the loss of the important strength component “power” which is essential for daily living activities such as; stand up, walk stairs, prevent fall. Together these components can also sometimes be named dynapenia. In Sweden, a municipality with a population of 50 000, about 10 000 (20%) of these people are of the age 65 or older (65+). These individuals are referred to as Seniors. *Accumulated mean values over 3 years, 2014 to 2016, from the authority Statistics Sweden. The Seniors that are most affected of this, not when it comes to the money, but to suffer the most from the fall are those in the age range of 80-90 years old, where the octogenarians are represented as 198 out of total 270 in this cohort. To this, we can add that women are more represented because there is more of a theme in those higher ages. In a meta-analysis (“Falls and their prevention in elderly people: What does the evidence show?”), they examined the most potent risk factor associated with falls within 16 studies where eight were conducted in community-dwelling populations and 8 were conducted in nursing home populations. Among these studies, leg weakness was identified as the most potent risk factor associated with falls and increased the odds of falling, on average, by more than four times (4.4; range, 1.5–10.3) (link). Avoiding This and The Cost of Not? The Swedish Civil Contingencies Agency has calculated that minor injuries cost on average around 800 Euros per case and severe injuries to cost on average 25 000 Euros per case. If we consider the hip fractures from the example above as severe injuries and calculate the costs at 25 000 euro per case (which is most likely far below the real cost for necessary adjustments of living spaces before a patient is able to go back to everyday living) the numbers → 78 hip fractures x 25 000 Euros = 1 950 000 euro/year. For the minor injuries such as a humeral fracture, per year, the cost of 270 cases at 800 Euros will come to equal around 200 000 Euros. The cost in total = 2, 1 million Euros per year, probably low calculated, for fall accidents in a municipality with a population of 50 000 where about 10 000 (20%) are Seniors 65+. The numbers of Seniors over 80 years old will, in Sweden, increasing the upcoming years 2020-2030 with +55% in both gender and in 2020-2050 will increase again +115%. During 2005, the population of Seniors 65+ in Sweden was 17% but in 2050 the same age group will be 25% of all of Sweden’s population. What will this cost and can we afford to not support these Seniors with good senior-strength-training devices and methods. Twelve weeks of high-intensity strength training in 80-year-olds improved strength by 20 years. 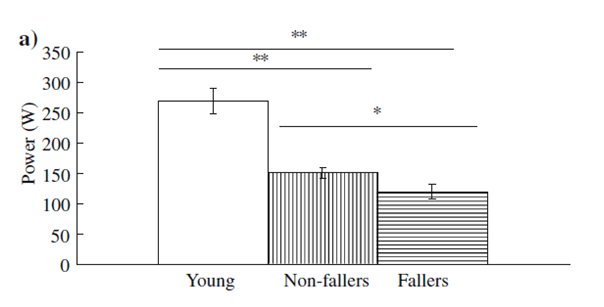 Strength differences between fallers and non-fallers among older groups – age (m) = 76 yrs – showed that the fallers just reached up to 80% of the power strength compared to the non-fallers seniors (P < 0.001). Power output showed clear differences between groups and fall status and appears to be the most relevant measurement of fall risk. Loss of muscle strength and balance are the main characteristics of physical frailty in old age. Postural sway is associated with muscle contractile capacity and to the ability of rapidly correcting ankle joint changes. Thus, resistance training would be expected to improve not only strength but also postural balance. 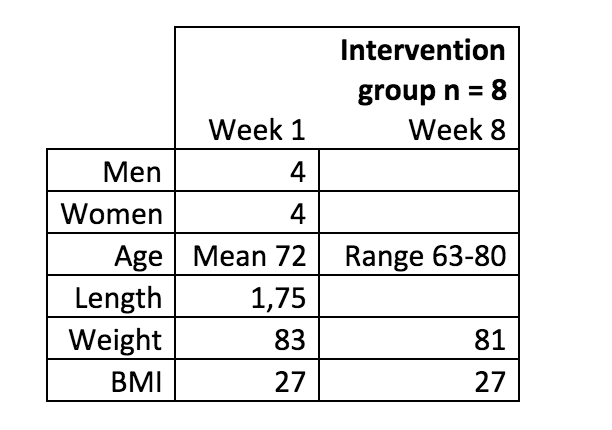 In this study seniors at age 69.9+/-1.3 years trained the knee extensors thrice weekly for 12 weeks either by flywheel training or by weight-lifting training. Greater gains in quadriceps strength. Greater improvements in balance performance compared with weight-lifting training. Quadriceps flywheel loading not only produces a greater increase in power than weight training but its physiological benefits also transfer/overspill to the muscle-tendon unit resulting in a significantly improved balance. At the Swedish School of Sport & Health Science (GIH) they have during spring 2017, autumn 2017 and spring 2018 performed three projects with flywheel training for Seniors (65+). 1.) Did the Seniors experience flywheel training at the kBox as safe, interesting, and exciting? 2.) Could the Seniors easily learn how to perform a “whole body” closed chain exercises with demand on, from the individual level, the high intense insert of force with retained balance in exercises like deep squat, lateral squat, high pulls and deadlifts? Yes, they were fast learning and after a few session could easily perform the training by themselves and had a fast and good familiarization phase with fine power development over just 6 sessions (2 times/wk x 3 wks). In this study, the Seniors performed exercises for the extending muscles in the knee joint, hips, back, and shoulders (postural muscles for upright position & balance). The exercises they performed were squats, lateral squats, deadlifts, and high pulls. Every session they did, each exercise was 3sets x10reps with maximal force effort. All those exercises are crucial for human movement “drills” like stand-up, walking, and lifting. Flywheel strength training creates an opportunity to increase and maintain daily life quality and enjoy an improved and extended health. The intervention, which was for 8 weeks, started with two pre-test sessions where with the kMeter they measured the peak power in the drills squats and lateral squats. From those pre-tests, they picked the best scores and then performed training for 3 weeks, twice per week (= 6 training sessions as a ”familiarization phase”). After three weeks of the “familiarization training” they once again made another test session and the peak power results had at that time for squats and lateral squats increased with +64,5% together (+63 and +66% respectively or expressed in watt/kg body weight from 2,7-4,4 for squats and from 2,0-3,3 for lateral squats). These fine results is very likely a result of both the familiarization phase of how to perform the exercises in a proper way as much as a neuromuscular adaption. The watt levels after week 3 can be seen as “baseline” levels for this kind of group (see table 2). The training then continued to week 8 when they did the post-tests and the stats for the training wk 3 to 8 was +17% together (+10 and +24% respectively), all test = p < 0.005. Recommendation for Flywheel kBox Training for Seniors Age 60-85+. Perform the given exercises twice a time week with load (inertia of the flywheel). With the kMeter you can easily in real time during training and tests measure both power and displacement (Range Of Motion – R.O.M.) as well as track the person or groups with different profiles (gender, age, medical history, etc). You can also mimic the performance values that a special group/person has by chose the same “load” (inertia) they have used and than perform for example a squat with the depth of 39cm (R.O.M) and create the peak power of for example 5.0 watts/ kg body weight (as the intervention group had in the study above at their post-tests after 8 weeks of flywheel training). It is important to train efficient strength and power by doing high-intensity strength training with big closed-chain-exercises that involve many muscle groups and joints and where balance factor (i.e. body centre of gravity) regularly is involved to prevent the early onset of sarcopenia. Although most people think that the need to develop power is only important for elite sports athletes, it is also absolutely crucial in the same way for Seniors! To learn more, you can always visit our page about the kBox applications for seniors. Please don’t hesitate to contact us if you have any questions.